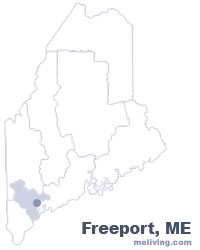 Freeport, Maine has been called “the birthplace of Maine”. It is home to Wolfe’s Neck Woods State Park, Winslow Park with a beach on Casco Bay, and Mast Landing Sanctuary. Visit Maine’s Desert Dunes and shop at L.L. Bean. LL Bean is famous for footwear and LL Bean Mocasins . Freeport was originally Indian territory and was called Westcustago and later on became apart of North Yarmouth. When the town was first settled it was called Harraseeket which is an Indian name for stream that runs through town. When the town was petitioned to be separated the General Court choose to name it Freeport after Sir Andrew Freeport which was a charactor in one of Joseph Addisons novels. To share any Freeport, Maine information with us, please contact us. Learn more about advertising in MELiving.